Our visit to Cebu followed in the grand tradition of our adventures through Asia — The Missus and I slept in while Kat went off adventuring. Specifically, she set out at a truly unpleasant hour to go scuba diving. The Missus has a deep mistrust of the briny deep (she’s still upset about the time I threw her into the surf during our honeymoon in Maui), and I am skeptical as to the moral justification for alarm clocks, so we were OK with giving this one a pass. It looks like she had a pretty great time, notwithstanding our naysaying. Surely the psychological cost of facing the malevolent seas with leaden-lidded eyes was a great one, but Kat overcame the odds and returned to us alive and in good spirits. Where you might see placid water, Amelia sees only doom. Kat received a certificate in recognition of her great sacrifice. Roughly five hours after Kat left for dive school (that is not a joke), The Missus and I crawled out of bed and somehow, heroically, found the energy to go to breakfast at the in-hotel restaurant. We were tempted to order room service, but we were in an adventurous mood that morning and resolved to explore the hotel for ourselves. Truly, ours is a story of adversity. Eating shrimp is the closest that Amelia will come to the ocean. I ordered some assorted meats and veggies in a skillet. They came with a lime. See the happiness that sleep and food can bring? It’s hard to eat mousse while scuba-diving, or so I’m told. After breakfast, The Missus and I headed downtown to see the sights. This took us through a series of neighbourhoods with some dramatic variations. Ramshackle houses gave way to gleaming towers in a “business park” (the Wikipedia page for which appears to be copied verbatim from a developer’s advertisement) and cavernous megachurches sat across the street from strip clubs. That paints sort of a grim picture, but that isn’t how the city felt. 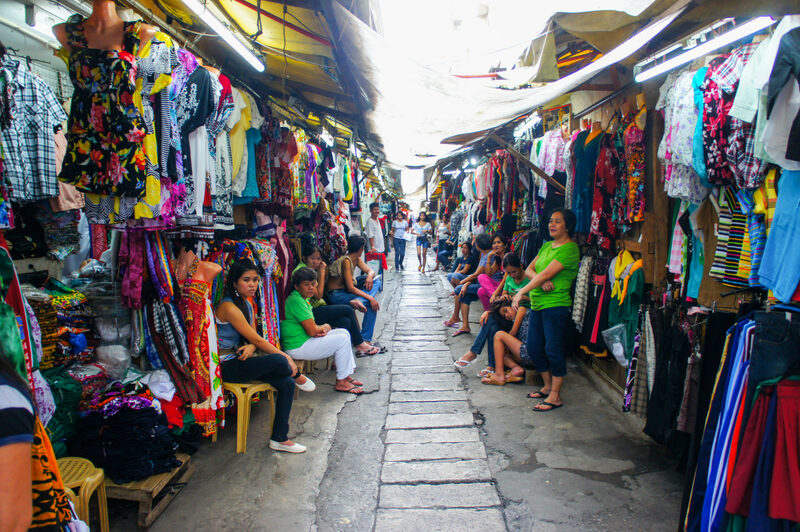 Cebu felt very much like a resort town, notwithstanding being the second-most-populous city in the Philippines. The city was a kaleidoscope of colours and architectural styles, all baking under the tropical sun. That truly is a gigantic church. We were headed towards the Crown Regency Hotel and Towers, home to the Sky Experience Adventure. It had come highly recommended from the concierge. 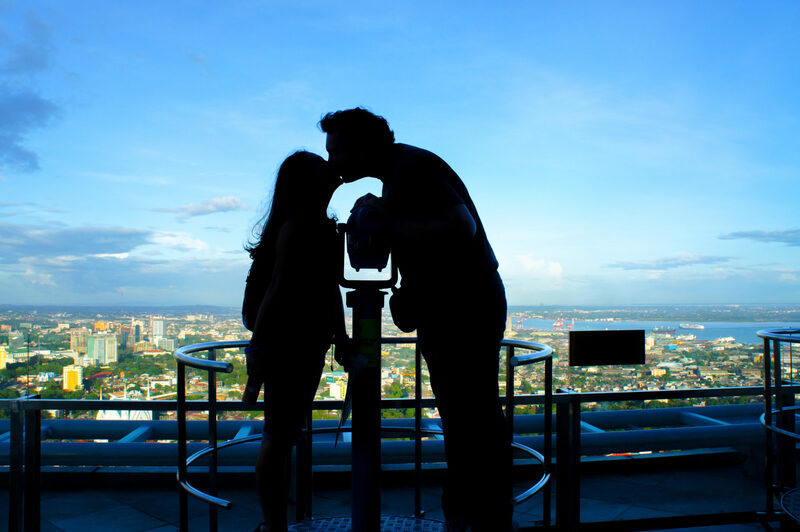 The Sky Experience Adventure inhabited the top floors of the highest building in Cebu, and featured a movie theatre, a zip line, a rock-climbing wall, a bar, the Edge Coaster (I’ll get to that), and, of course, one heck of a view. 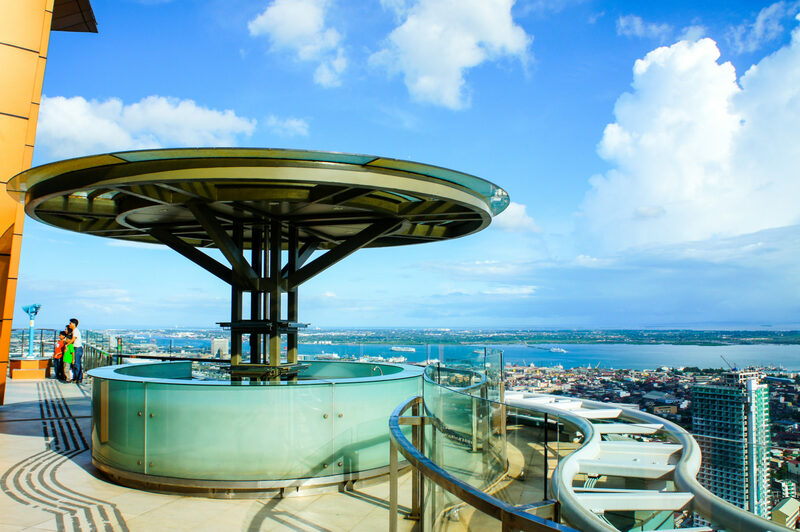 You can contemplate the horizon while sipping on a martini at the open-air bar. The Sky Experience Adventure — wait, that is getting tiring; I’m going to call it the “SEA” from now on — the SEA had a token-based system for paying for activities. Upon paying for admission, you are issued a wristband with an RFID chip carrying a certain number of tokens. Every time you want to do something, you wave your wristband over a sensor, which deducts the appropriate number of tokens. 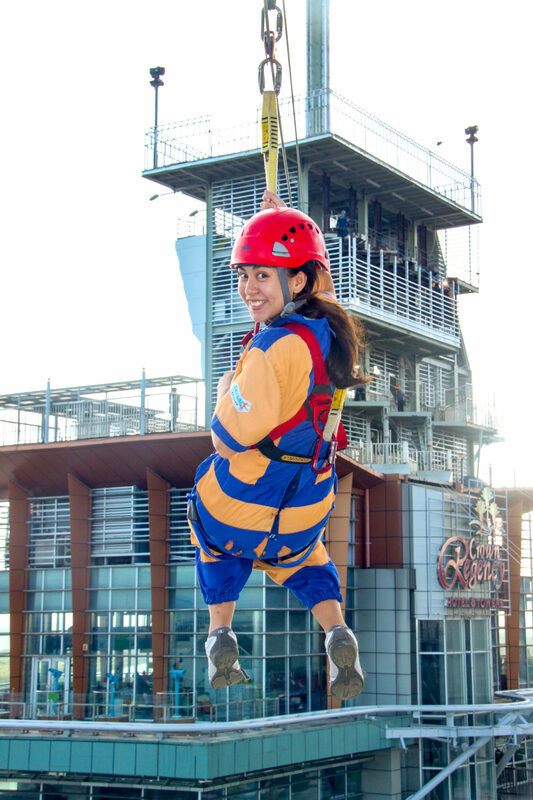 The Missus was eager to put these tokens to good use, so she made a beeline to the zip line. 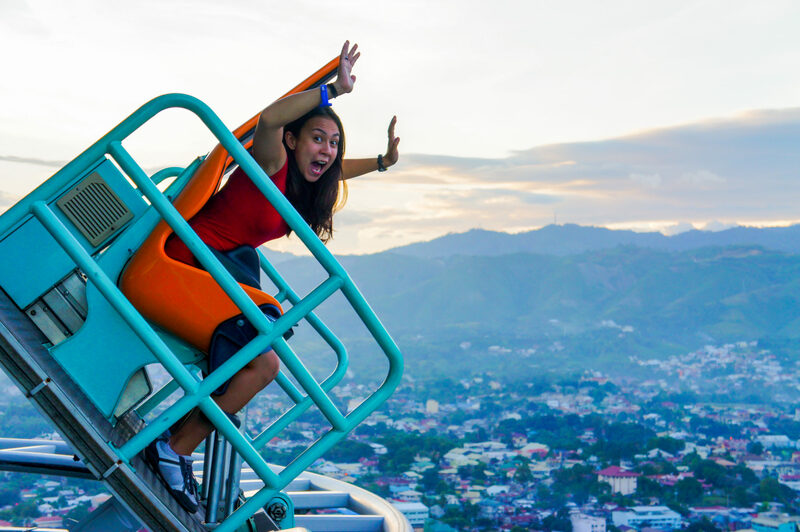 The zip line (“TOWER ZIP!”, as the signage referred to it) stretches from the top of Cebu’s tallest tower to an adjacent, slightly-smaller tower. It’s not terribly long, by zip line standards, but it is a dizzying 473 feet above the streets below. For whatever reason, The Missus does not treat gravity with the same suspicion as the briny deep. While The Missus was getting ready for the zip line, one of the attendants asked whether she was my wife. This was literally the first time that this had happened in Asia. My enthusiasm was tempered by the realization, a few sentences into this conversation, that the attendant was under the impression that The Missus was a local (and much younger) girl that I’d swooped in to carry off to a glitzy life abroad. Not content to be the only one made uncomfortable by this exchange, I have spent the following several years exclaiming (more-or-less at random) “such great beauty!” to The Missus. My impression is uncanny, I assure you. [amelia] was not aware of this exchange until after she returned from her perilous adventure. You might be wondering “Wait, how did The Missus get back to the SEA after being deposited on an adjacent building?” Firstly, good on you for consistent use of acronyms. 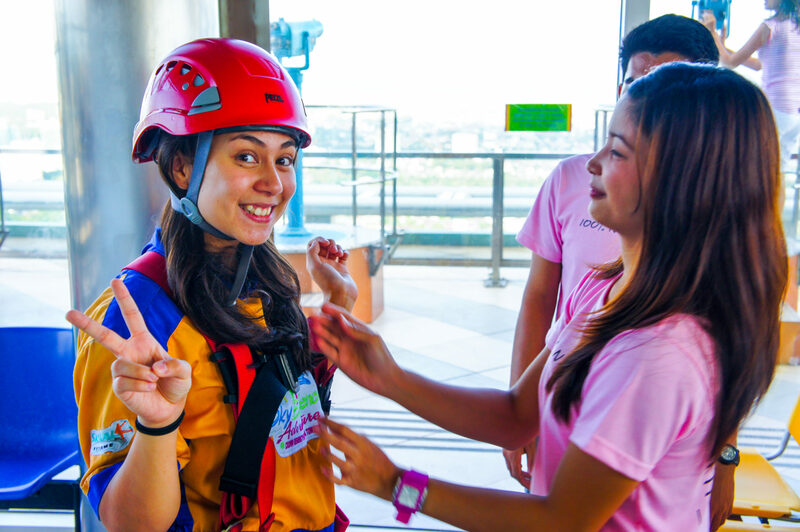 Secondly, the zip line is a two-parter; after arriving at the adjacent building, The Missus took a second zip line, landing her on a lower floor of the Crown Regency Hotel and Towers. This floor was also part of the SEA, and was home to the rock-climbing wall. Thankfully, there were elevators, so she did not have to climb back up to the summit. I didn’t share The Missus’s enthusiasm for death-defying attractions, so we went to the SEA’s theatre so I could spend a token or two. The theatre was a bit of a gimmick — it’s one of these “four-dimensional” things where they spray mist in your face when water shows up on-screen. One particularly startling feature was a set of moving fibres underneath the seats that tickled the back of The Missus’s legs while furry critters (rats, maybe?) scurried around on-screen. I was wearing pants, and so was a little confused by the sudden shrieks coming from my capri-clad companion. After taking in a fifteen-minute 4D featurette, we headed back up to the observation deck. We carefully surveyed the surrounding scenery. After all this, The Missus still had plenty of tokens to spare for the Edge Coaster. Now, the Edge Coaster is like a roller coaster, except it might be better described as a tilter coaster. Which is to say that, instead of rolling up and down undulating tracks, the edge coaster follows a flat track around the circumference of the building, and tilts forward so that passengers are facing the street. I noted (vainly) that people typically prefer to face the horizon, and not concrete streets 473 feet below. Although I feel that I provided a fairly compelling set of reasons, The Missus would hear none of it. She was resolute in her desire to, uh, coast in an edgewise fashion. The face of a woman who mocks gravity, as long as there’s no water beneath her. There was more to do at the SEA, but we were nearing the appointed time (about 4pm) when we had agreed to meet Kat back at the hotel. The Missus reluctantly left death un-defied at the remaining death-defying attractions. I left somewhat less reluctantly. Imagine my chagrin, then, when Kat’s immediate reaction to being regaled with our tales of the SEA was “I want to do that, too!”. They nipped my objections in the bud by making the return trip contingent on first visiting the Crown Regency Hotel and Towers’ world-class buffet dinner. My travelling companions may not be in possession of properly-calibrated self-preservation instincts, but they are excellent negotiators. We returned to the Crown Regency Hotel and Towers without complaint. This fine gentleman could (and did) make a range of pastas to suit one’s palate. I usually assess the fanciness of an event based on how much fruit has been cut to look like other things. Amelia shows off her RFID bracelet, still loaded with tokens. My bracelet had plenty of tokens left, so I passed it off to Kat. 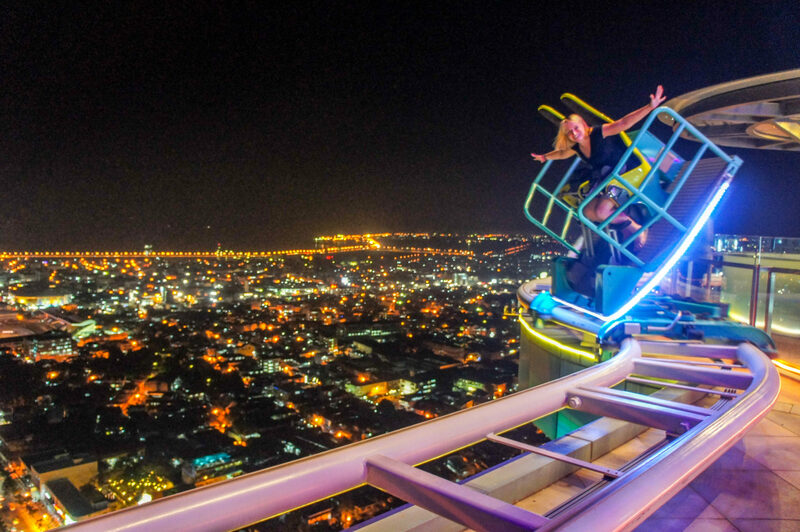 She shared The Missus’s enthusiasm for the Edge Coaster, though her view of the city was much sparklier. Unlike [amelia], if there were water below, Kat would likely have tried to dive. The Missus had just enough tokens left to attempt the last of the SEA’s attractions — the Skywalk Extreme. The Missus and Kat have a well-documented love of these deathtraps, although my enthusiasm has been more muted. At any rate, I was without a wristband (having gifted mine to Kat), so I was, sadly, unable to accompany them on their vertigo-inducing brush with death. Amelia wished me goodbye, possibly for the last time. 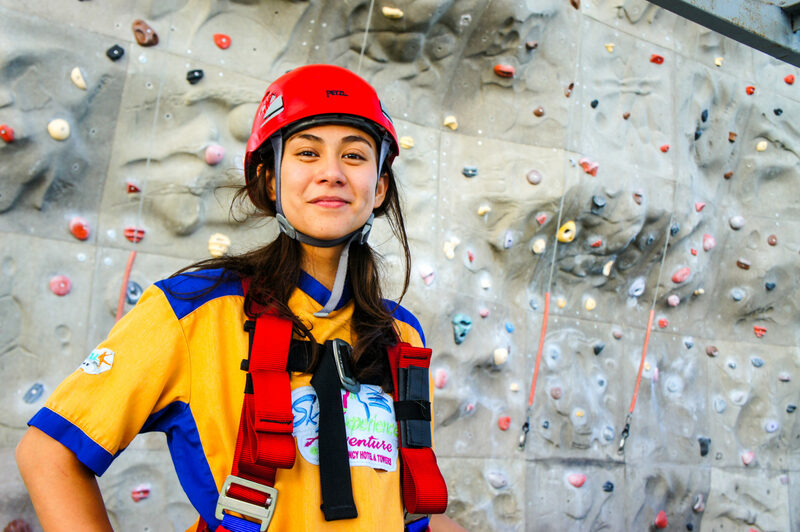 Amelia and Kat gave a display of bravado before ascending the Skywalk Extreme. Fun fact: these certificates also act as life insurance waivers. Fortunately, my travelling companions survived their foolhardy expedition and we returned to our hotel in one piece. Er, three pieces, I guess. We were each intact, is what I’m saying. The next would be our last day of adventuring in the Philippines, and (moreover) our last full day spent travelling beyond our home base of Hong Kong. The SEA had been fun, but was wanted our final excursion to be a return to form. In our case, this means one thing: temples. So many temples. Fortunately for us, Cebu is home to the Philippine Taoist Temple (also called the Cebu Taoist Temple). 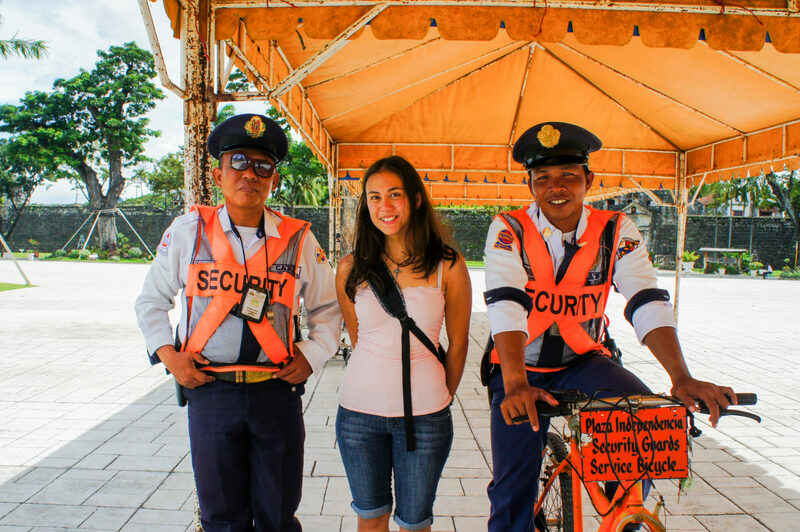 The temple is nestled into the Beverly Hills region of Cebu. That name isn’t an accident; this Beverly Hills is very much a parallel to its infamous namesake in Los Angeles. Here the great and good of Cebu make their beds and say their prayers. The local temple is reflective of the opulence of its surroundings, which makes it a fantastic tourist destination. The temple was seated on a hill, at the top of a long series of stairs. Someone must have told this lion/dog statue a heck of a joke. Towers, greenery, dragons — this place had it all! A pagoda oversaw the outer grounds from its perch above. This imitation Chinese wall connected the temple to the parking lot. I do not know enough about Taoism to tell you what these statues are about. One of the many ancient and holy shrines of the temple, I assume. Kat has always wanted a lion/dog. This dragon welcomed visitors to the temple. The temple is a popular spot for people seeking to have their fortunes told. The fortune-telling process goes like this: the fortune-seeker washes his or her hands, lights some incense, and prays. They then grab two wooden blocks shaped like kidney beans; the blocks are flat on one side and round on the other. The fortune-seeker asks a question or makes a wish and then tosses the blocks. If both blocks land round-side-up, the answer is “no”. If the both land flat-side-up, the answer is “maybe” (the sign advises that you should have asked a clearer question, and suggests that you ask a temple attendant for help). If the blocks are mismatched, then congratulations — that’s a “yes”. If that sounds a lot like Pass the Pigs to you, well, I don’t know what to tell you other than perhaps you’ll need to play with greater reverence next time. After our visit to the Taoist temple, we trekked to downtown Cebu, where we saw a host of cultural sites in quick succession. The first was Fort San Pedro (or, as its founding conquistadors referred to it, Fuerza de San Pedro). The fort’s history goes back nearly 500 years, though the buildings have gone through several iterations. Apparently Spain didn’t check up on this fort until 200 years after it was founded. The interior grounds looked more like a bed and breakfast than a military installation. We were there, at that fort. I’m not just making all this up. There were lots of neat little statues nestled in corners on the fort’s grounds. The fort is of particular significance because it formed the military arm of the first Spanish settlement in the Philippines. 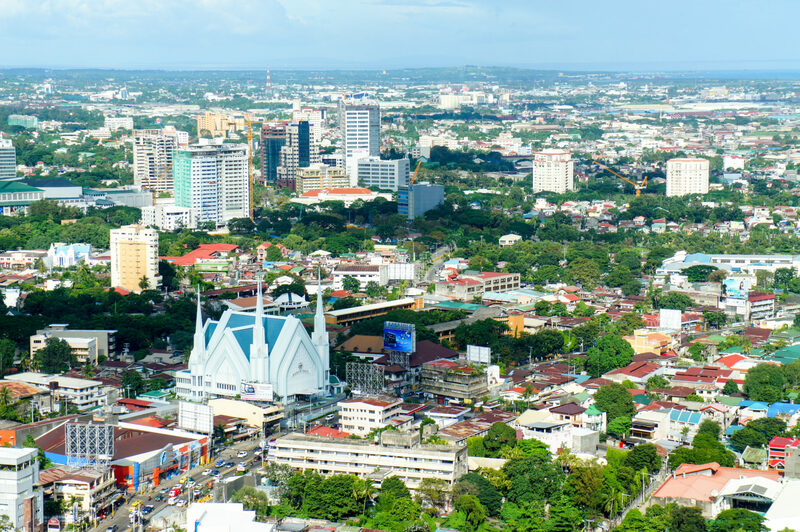 We hadn’t realized this before coming to Cebu, but the Spanish did not first land at Manila — they came to Cebu, which became the epicentre of a centuries-long campaign of colonization and conversion. Today, Fort San Pedro is a smallish structure tucked into Independence Plaza (“Plaza Independencia”). It has a butterfly sanctuary, and at one point housed a small zoo. 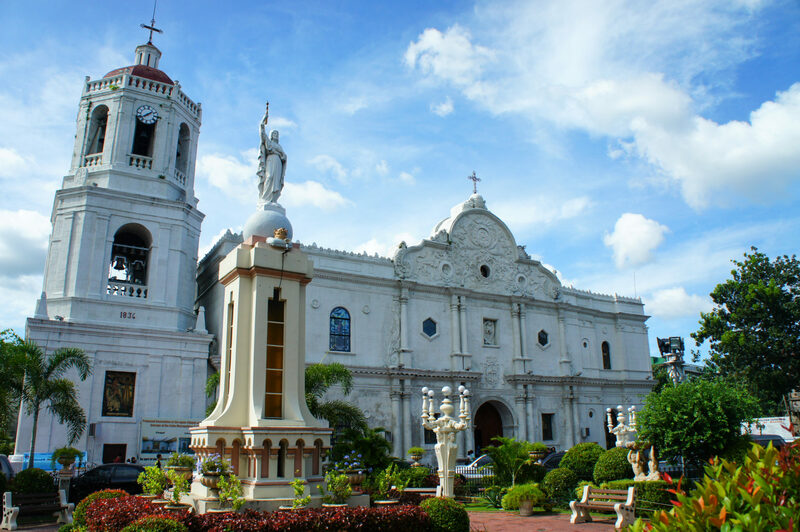 The Spanish heritage of this portion of Cebu has not received the same careful maintenance as Manila’s Intramuros. Frankly, I don’t blame them — as you may recall, the reverence for Intramuros was confusing to me. Turning a fortress into a butterfly garden, though? I get that. The fort was surrounded by various monuments, including an 1855 plinth honouring Spanish queen Isabel II and a 2006 structure celebrating “400 years of continuing OAR presence in the Philippines”. The OAR is the Order of Augustinian Recollects, the earliest Catholic missionaries to set up shop in the Philippines. The Philippines has to be in the running for Most Catholic Country, so you can’t fault the OAR’s effectiveness. That seemed like a lot of Spanish-centric monuments to have in a park that nominally celebrates Filipino independence, but hey, I’m hardly in a position to tell the citizens of Cebu how to embrace their heritage. While we toured the plaza, we ran into two security guards. They were pleasant fellows, and we hung around to chat for a minute. One of them (the one of the bike in the photo below) took a bit of a shining to The Missus, and asked what she was up to later. She let him down gently — clearly he could not help but be drawn to her great beauty. [amelia] was standing in the most secure spot in the park. We left Plaza Independencia in search of the next major landmark. Along the way, we spotted some truly glorious jeepneys. Our love affair with the Philippines’ signature mode of transport is well-documented, and Cebu was home to some of our favourite jeepney designs. I think that the Skipper is my favourite jeepney from the whole trip. This isn’t a true jeepney, but it has its own charm. Arlyn is really committed to the whole pink thing. It’s got a crown and everything! Not far from Plaza Independencia is the Cross of Magellan. Remember how I mentioned that the Spanish first landed at Cebu? Well, when I said “the Spanish”, I meant “Ferdinand Magellan and company”. Ol’ Ferdie made landfall at Cebu, planted his eponymous cross, and swiftly got to converting the locals. Apparently Magellan got along pretty well with the people of Cebu, but not so well with their neighbours on Mactan — Magellan got killed shortly after arriving. Anyways, the people of Cebu (and the Philippines in general, including modern Mactan) are big fans of Magellan’s Cross. They even built a bigger, hollow cross around it to protect the original cross from souvenir-seekers (apparently chips of Magellan’s Cross are a popular keepsake). They also built a chapel around it, for that extra layer of protection from the elements. I just noticed the little fire sprinkler right above the cross. Probably a good idea. Packing a big ol’ cross around the world seemed like a lot of luggage, even to Kat. The base of the cross was surrounded by candles. Right next to Magellan’s Cross is the Basilica del Santo Niño. As one might expect, given the above history lesson, the Basilica is the oldest church in the Philippines, founded in the mid-1500s. The current building dates back to the mid-1700s. 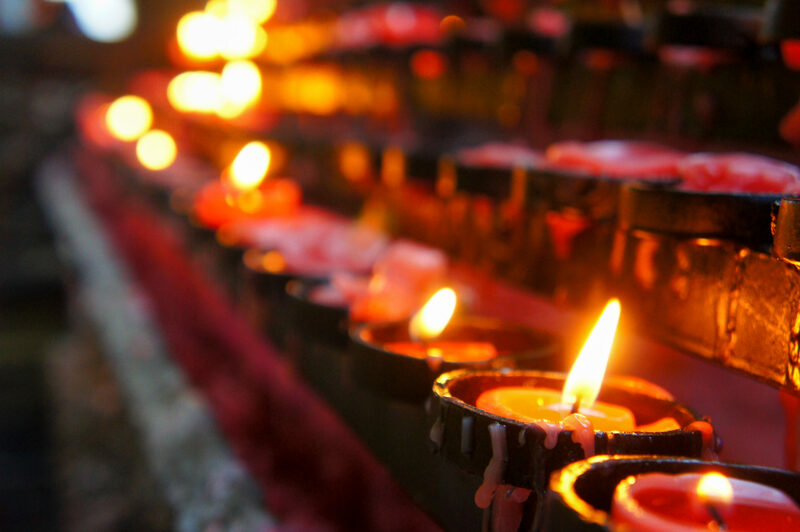 Like the Church of the Black Nazarene in Manila, the church is regularly overflowing with people, despite holding more than a dozen services on the most popular days. The Basilica’s solution to this seemed a little more elegant than the Black Nazarene’s; the Basilica now faces out on a gigantic outdoor auditorium (called the “Pilgrim Center”), which is used for the most popular services. Since this was Sunday, we planned to attend a mass. The Basilica hosted several masses each day, some in English and some in Cebuano (a local language indigenous to the area). We happened to be there between masses, so we noted the time of the next English mass and took the opportunity to wander freely through the church and its surrounding grounds. The Basilica, as seen from the wide-open area of the Pilgrim Center. The inactive neon lights really add a certain je ne sais quoi to the old stone building. It would not be a Filipino church without someone selling Angry Birds balloons outside. The walls were lined with historical scenes and religious figures. The church included a convent with walled courtyards. The interior of the Basilica was quite striking. The church had a side room with various icons for private prayers and contemplation. This statue of the Virgin Mary was particularly popular. These yellow-skirt-wearing ladies sold candles. They were clustered around each entrance. We continued our tour of this historic area of Cebu. Just a few blocks away was the Cebu Metropolitan Cathedral. This church got demolished in World War II, and so the current building was quite a bit more modern than the old Basilica. The Cathedral is the seat of the local archdiocese, which means that it is technically superior to the Basilica in the ecclesiastical org chart, despite the Basilica being older and larger. That seemed a little unfair to us, but (by way of counterpoint) the Cathedral is tremendously pretty. A wedding was going on, so we did not head inside. Just past the Cathedral was a large monument in the middle of the road. It was called The Heritage of Cebu, and it was composed of dozens of larger-than-life statues arranged on a dais. 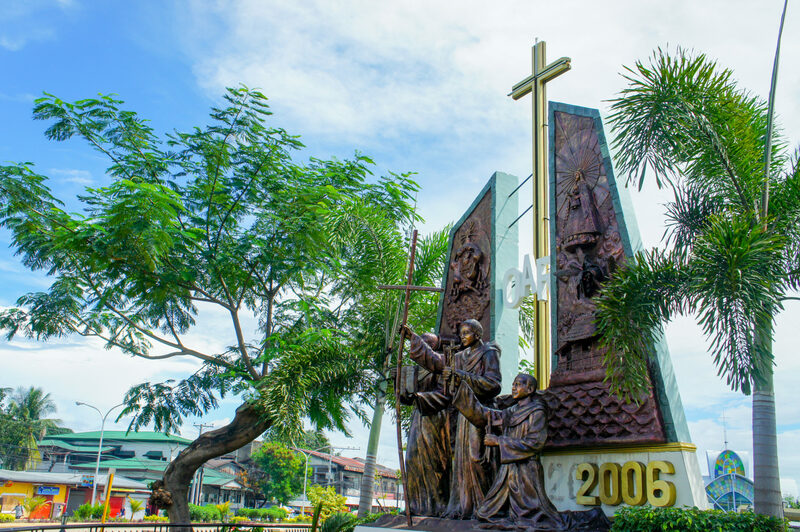 The statues were arranged into groups depicting historic events and figures, including our old friend Ferdie, his defeat at the Battle of Mactan, the conversion of native Cebuanos, and local figures of historical significance (including a saint and a former president of the Philippines). Importantly, the monument was neighboured by an ice cream vendor. We enjoyed some frozen treats while contemplating the symbolism of the various faces of the monument. Sergio Osmena, former president of the Philippines. Ol’ Ferdie is in for quite the surprise. The procession of the Santo Niño. We weren’t just gawking at churches and monuments all this time (though we were certainly doing plenty of that). Kat was on the hunt for appropriate attire for the evening mass — she had taken the acceptable clothing signage we saw in Manila to heart, and knew that her tank top would not pass ecclesiastical muster. This hunt took us through commercial areas, which was more entertaining than expected. I have a special fondness for the hundreds of knock-off iPods (only 350 pesos each — about $9.50! ), but my favourite sighting was a series of help-wanted signs. One asked for candidates’ “family background” and reminded job-seekers that “GOD WORKS IN MYSTERIOUS WAYS.!!!”. Another requested (among other things) that applicants for a sales clerk position be 5’2” in height, have a pleasing personality, be able to provide a birth certificate, and pass multiple types of clearance. We weren’t looking for quality MP3 players or a rewarding career, though — Kat was just looking for something that would cover her shoulders. This was more challenging than it seemed. Despite Kat’s relatively trim figure, she’s something like a quintuple-extra-large in Filipino sizing, so suitable shirts and other coverings were in short supply. Even a simple shawl eluded us. We spelunked these alleyways for hours, to no avail. Eventually the time for mass drew near. Kat decided that any moral obligation had been fulfilled by her extensive search, and that the Basilica would just have to survive a pair of exposed shoulders that evening. We returned to the Basilica for evening mass. The service that evening was not entirely in English — the sermon was based around seven Cebuano words, although we didn’t quite catch what they were (the priest was heavily accented and offered no translations). The gist of it was that each of these words offered a different perspective on a single concept, and that Jesus demonstrated each of these distinct-but-related meanings at various times. My retelling is lacking in details, I admit, but in my defence: we were thoroughly confused for most of the sermon’s duration. My takeaway is that the sermon seemed to be a sort of Cebuano spin on the classic lesson on the four Greek words for love that is popular at pulpits the world over. Our return to the Basilica was not entirely in vain: we arrived just in time to light some candles. By this point, the day’s activities were nearly done. We had a flight to Manila scheduled for that evening, but had just enough time to catch a quick bite to eat. We only had to walk a block or so to find the perfect place — Jollibee! This is the Filipino McDonalds; it has a ton of locations in the Philippines and worldwide, but none in our native Canada (at least, not yet). We spotted their mascot (appropriately, a jolly bee) from afar and made a bee-line (get it???) to the eatery. We did have to walk past a security guard with what appeared to be a pretty well-maintained assault rifle in order to enter. Unfortunately, we did not want to ask that rather imposing fellow for a photo, and I don’t know much about guns, so I can’t provide much more detail than “it was a surprisingly large gun for a local fast food establishment”. In any event, we had a very pleasant meal in this particularly secure downtown Jollibee location. That is one high-class bee. He’s even got a bowtie! Amelia had a perfectly cromulent sundae. A helpful (and unarmed) employee took a photo of us soaking in our multicoloured surroundings. With our hours in Cebu now spent, we headed back to our hotel and waited for a cab to the airport. We took those few minutes to relax and reflect on our journey. Once we got bored with that, we wandered around the hotel’s lobby, which was fully outfitted in Christmas gear notwithstanding it being mid-November. On this, the Philippines and I are of a mind. If your Christmas decorations aren’t up on November 1, I urge you to reconsider what you are doing with your life. They don’t waste any time in the Philippines – I hear that Christmas season starts in August. This is a replica of the Santo Niño, an icon of Christ. Note that it is in our hotel lobby – the Philippines are super Catholic. This looks adorable, until you realize that Kat is collapsing from exhausting and using Amelia for support. I thought I was being funny, but now I have to live with this photo. Our taxi took us to the airport, our plane took us to Manila, and another taxi took us to a hostel. Due to booking shenanigans, our flight back to Hong Kong wasn’t until the following morning. It’s all for the best, though. Our hostel had plenty of, uh, character. It was just crammed full of stuff. I am avoiding a more descriptive caption in order to avoid unsavoury SEO traffic. We tried to emulate the Buddha’s jovial acceptance of his circumstances. Mercifully, our beds were not ingeniously-designed torture devices (unlike our previous Filipino hostel experience), and we managed to get some decent sleep. Come morning, we were whisked off to the airport, where we caught our flight to Hong Kong without incident. With final exams and paper deadlines looming, we would be staying in Hong Kong for the rest of the semester. Our final adventures in Hong Kong would be entirely different from our jetting jaunts; rooftop barbecues, local restaurants, evenings with friends, and familiar streets would take up our free moments. It would be the perfect end to a hectic semester abroad. 2 May 2015 11 February 2018 Christopher ScottComments are off for this post.